Another charity honored philanthropist Harold Matzner this month which may not make them unique, but let me tell you about this charity. It’s Tools For Tomorrow, founded 15 years ago by artist, educator and author Rachel Druten, who now teaches all those crafts. Rachel’s idea for helping at-risk children was to meet not just their physical needs, but their emotional longings for creative outlets and feelings of self-worth. She accomplished this by providing professional teachers who would hold after-school classes in art, music and acting for at-risk children in a few local schools. The need for such a program was so great, her Tools For Tomorrow classes were filled — with a waiting list almost immediately. From that modest beginning TFT has grown steadily, leaping from 100 children helped the first year to approximately 7,850 over the past 14 years and approximately 850 this year. Think about it. That’s 8,700 fewer potential gang members; 8,700 fewer drop outs, runaways and hopeless, helpless kids on our streets. » “I like my teacher and music and art…we do emotions like greedy, tired, afraid, jealous, depressed and bored, it is exciting stuff.” Angelica, 10. 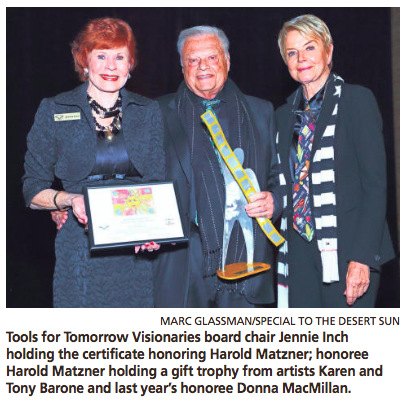 Jennie Inch, board chair of the TFT Visionaries, who created this event, reported that in their first year the Visionaries had attracted 70 members and raised almost $130,000. The major sponsors for this event were “Angels” Rebecca Benaroya, Donna MacMillian, Harold Matzner and Arlene Schnitzer. Platinum sponsors were Sherrie and Ronald Auen, JoAnn McGrath and Jan Salta. Silver donors were Carol Curtis and Geof Kirsch, Barbara Fremont, Helene Galen, Jennie and Bob Inch, Janice Lyle, Judy Morley and Bob Williams, CJWestrick and Tom Bomar. The creativity (and dollar-stretching skills) of TFT’s leaders were reflected in every facet of this well-done event. For example, instead of producing an expensive ad book video on Matzner, they simply showed a big-screen reproduction of each tribute ad in the program. The beauty of the ads’ art work and sincere comments by Matzner’s admirers created a touching tribute. It was also apparent that, long before there was any talk of honoring him, Matzner, as an “Angel” sponsor, had quietly given the organization major support. This luncheon event, with tickets at $125 per person, raised about 250,000 in ticket sales, sponsorships, donations and the sale of cards featuring the kid’s artwork. This will pay for another 600 at-risk children to spend their after-school time singing, dancing, painting, acting, and writing instead of being on the streets. What a bargain! As for the honoree, Matzner is known for his steamroller style of tackling tough jobs until everything is rolling smoothly. But when people try to thank him, he squirms uncomfortably and changes the subject. So, typically, his remarks were brief and deflected back to the charity.